Matfen Hall has watched over some of Northumberland most stunning sunsets for almost 200 years, I have been lucky enough to work here for the past 5 of them. I know I’m biased but I really do think it is one of our regions most beautiful stately home hotels. The Hall was built on the site of an earlier Jacobean house in 1832 by Sir Hugh’s great-great-grandfather Sir Edward Blackett, the 6th Baronet. Parts of the earlier house dating from 1690 survive on the west side of the building. The original lintel stone with the motto of the Douglas family who built it, is displayed in the entrance hall. The last family member to live in Matfen Hall was Sir Hugh’s grandfather, also Sir Hugh Blackett who died in 1961. Following his death and sale of much of the contents to pay death duties, the Hall was leased to the Leonard Cheshire foundation. They cared for some 30 severely disabled residents and were in occupation until 1995. From 1997 Sir Hugh and Lady Blackett invested in a massive programme of work to the fabric of the building, and we opened our doors as a hotel in 1999. A lot has changed since these early days we have added a Spa, a further 22 bedrooms not to mention continuous refurbishments. That being said there is one thing that has not changed the family feel and ethos of Matfen, when you work at Matfen you are not just part of the team, you are part of the family we all have such a pride in the estate. It’s the family feel at Matfen that brings me on to my favourite time here – its when the lights go down, the fires are stoked and everyone just seems to slow down and sink in to a comfy chair. Before I head home for the day I love to walk through the original side of the Hall from reception through to the East Wing. I start my journey at the Conservatory which was added t he hall in the early 1900’s, its now our residents bar and there are guests sitting enjoying a Merlot looking out on to the golf course, you can just see Wellingtonia trees casting their last shadow before the sun finally sets. I wander through in to the drawing room where our diners are relaxing with an aperitif and some canapés before they head in to The Library our 2 AA rosette restaurant to enjoy something delicious that has been created by Paul Blakey our head chef. The smell of his dishes are wafting through and make me a little jealous that I’m not joining them. If its an evening when we don’t have an event on I can continue in to the stunning Great Hall with its enormous stained glassed window, the lights in the inner courtyard spill through the window and the colours of the glass almost dance on the floor, the hall is dimly lit and the old romantic in me imagines Mr Darcy walking down the staircase – then I remember its 2016 and perhaps riding breaches aren’t quite on trend anymore! Its time for me to head home after my days work at the hotel is done, but I cant resist a little detour through the Dutch Garden, its so lovely and unspoilt and it’s a clear night so the moon shadows trick my eyes, the climbing ivy and leaves on the trees shimmer and even if its been the toughest day at the office, I step back and realise how lucky I am to work here at Matfen, in the stunning county of Northumberland, the rush of the day and the city feel like they are a million miles away, yes my favourite time – lights out at Matfen. 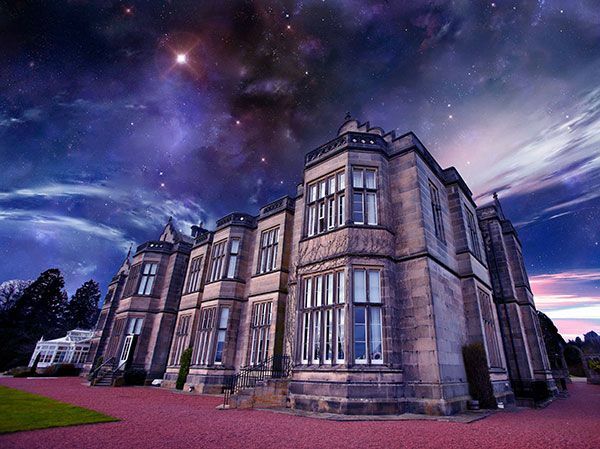 Matfen Hall is a country house hotel set in Northumberland, adjacent to its own golf course.